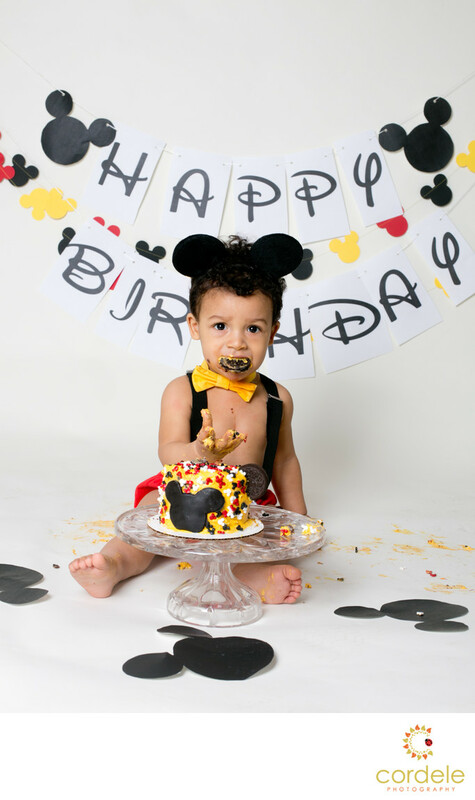 A cake smash that involves Mickey Mouse in Massachusetts? Look no further, we have a photo right here to prove you can do it! It's a simple theme with just a few paper Mickey's on the ground and a home made banner in Disney Font. Finding the right theme for a cake smash can be daunting. You don't want an over complicated theme and you don't want something that isn't cute and fun. You should book your portrait session for the cake smash about 1 month out. That way all available props are ready to go and backdrops can be ordered. Clients should book a cake smash session because this is a milestone you don't want to forget. Kids grow so quickly, it's hard to remember a time when they were ever so little. Photographing them at their first birthday helps freeze them in time and give you a great memory to look back on. I shoot portrait sessions typically in my studio in Reading, but I have been known to go to people's homes and set up a session there. Sometimes kids do better in their own environment. It's totally kid dependent. As you can see from my site, I have several different types of themes available, but the sky is the limit. I have learned that simple is better. When you make the theme too complicated with too many props you have a very very distracted baby. You won't end up with shots of the cake because the baby is too interested in the colorful props all around them. If you noticed, I don't add a lot to my cake smash theme photos. I want the kids to get a nice photo and then get into the cake. If we add to many props, when the cake goes down they don't even care! Save multiple props for their portrait sessions. One thing that I love about photographing kids cake smash sessions is that the sky really is the limit with ideas. I find a lot of my inspiration comes from what my kids are reading. That's where Brown Bear Brown Bear cake smash theme was born. Whatever you kid is into I would love to try and create a theme surrounding that. Anything is possible with enough time and planning for the session. Location: 40 Marla Lane Reading Massachusetts.